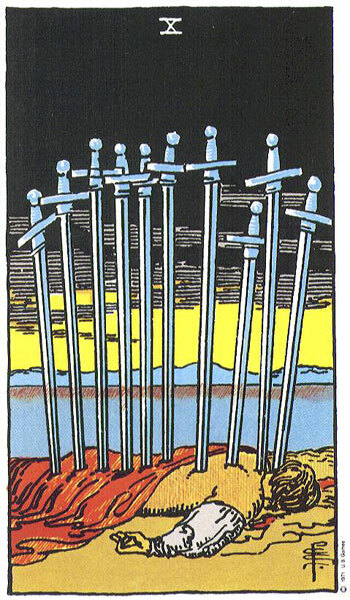 Back to the Rider-Waite for today…The Ten of Swords suggests a sudden loss or disaster, but it’s not as bad as we think it is. What happens will be fatal for lies, and we’re better off with the truth anyway. See the daylight rising in the distance? Notice the mountains there and how closely they parallel the mountains on the Ace card, as if they were the same mountains. 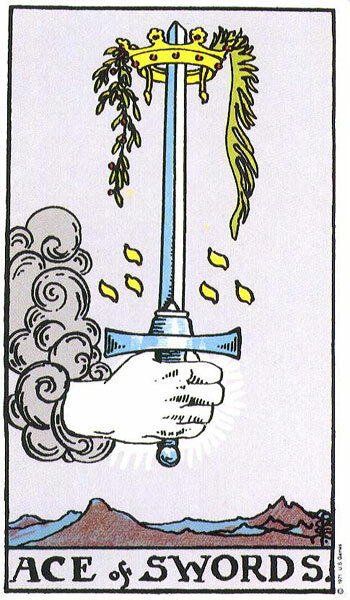 Today’s events, whatever they might be, will bring us new understanding (Ace of Swords) and put us in a position to act on that understanding, to move forward with the power of truth and honesty in our hands. The truth is far more empowering than we realize. That doesn’t mean this won’t be an emotional day. We will find we have an ocean of feelings about whatever is going on.